People who have been reading the site for a while know that traditionally, I like to do a little wrap up for each of the conventions I attend. Typically, I end up seeing a movie with whomever I’m with and I talk about it here. The only problem with going to Wizard World Chicago this year is that there weren’t any good movies to see! We toyed with seeing Rush Hour 3, but frankly, too many people were against it. If they went, they’d be going to rip it a new one. Myself likely included. The inside joke of this comic is that Gordon is the one suggesting we go see it. He was probably most against it of anyone. Oh, and Brandon J. Carr’s wife really did make him swear not to see Stardust without her. 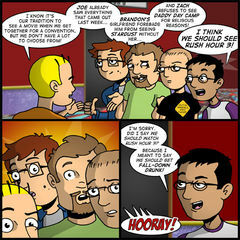 And for the record, the other two guys in the comic are Joe Dunn from Joe Loves Crappy Movies and Zach Miller from Joe and Monkey. As always, it was a treat to attend Wizard World Chicago and exhibit on Artist’s Alley. I would have liked to have sold a little more merchandise, but I did about as much business as last year, so at least I’m not backsliding. The Spoiler shirts are always a big hit at conventions. I have one of them pulled over a mannequin torso I stand up on my table. Invariably people stop to comment on it. Either they laugh and walk away saying “That’s a great shirt!” Or they laugh and say “I gotta get that shirt.” I suppose the third option is when I get to talk to the person and explain which spoilers come from which movies. I’ve been selling the Spoiler shirt for the last three years. At times, I wish I could come up with another t-shirt design that would sell just as well. A t-shirt design that isn’t Spoiler II. But what can I say? They’re the breadwinners and you gotta stick with a winning horse. I don’t know that I sold as many books as I would have liked to. But I think I hit on a new merchandising structure that I’ll probably employ in the store soon – everything will be $15 and you’ll get 15%, 20% and 25% discounts the more stuff you buy! I think it will be really attractive to you guys and will help me keep things organized on my side. I don’t mean to harp on the money aspect of things so much. That’s really only a small portion of the exhibiting experience. I’m grateful that I’m able to sell anything at all! It always amazes me. I did a lot of good networking at this convention. I got to meet Brandon for the first time and DJ Coffman from Yirmumah and Hero By Night as well. They couldn’t have been nicer. Really easy to talk to and a lot of fun to be around. We all kind of share the same sense of humor, so it makes things easy. For all practical purposes, someone like Brandon is a complete stranger. But within minutes I was joking around with him and having a blast. I was interviewed by a few online and offline publications and that was pretty cool. I have a wallet full of business cards on stuff I want to follow up on. Professionally and socially, I would say it was a really successful convention! That said, the last day of a convention is the worst. Part of you is counting down the hours until you have to pack up your stuff and ship out and that’s never fun. And then, for me, the car ride home is tortuous. I have no one to help me cover the 6 hours from Chicago to Des Moines, so I’m often left with my own thoughts. Every convention is a good learning opportunity to see into other artist’s process and business practices. I constantly find myself taking mental notes for things to try when I get home. As exhausting as it can be to constantly compare yourself, going to Wizard World Chicago has revitalized me. I think also having crossed the five-year anniversary milestone has inspired me make Theater Hopper stronger. Not just the comic, but the entire Theater Hopper experience. I want to rid the THorum and the front page comments section of spammers and bring back the positive, excited atmosphere. I want to be seen more among my peers in online communities and talk more about comics with them. I want to do more guest comics – just because. I want my site to look better. I want to try new things. I want to advertise in unconventional places and spread the word about Theater Hopper. I’m proud of what I do. Five years and two self-published books under your belt can do that for you. But it doesn’t mean there isn’t room to improve. I’m at the point now that I’m considering outside help to spruce up the site. In some respects, if Theater Hopper is going to be taken seriously, I have to treat it like a professional venture. This is much more than a hobby site we’re talking about. I’ve experimented with a lot of things. Now it’s time to make them stick.